How I wish I could have been even a fly on the wall at this overnight to listen to the exchange between Paul Garbarini, Terry James, and Joseph McGill, Jr. Thank you for working to tell the rest of the story! 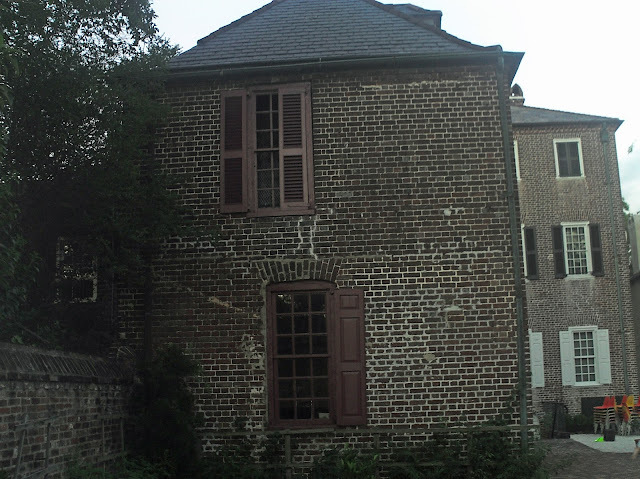 “Located in the downtown Historic District, within the area of the original walled city, this brick double house was built in 1772 by rice planter Daniel Heyward as a town-house for his son, Thomas Heyward, Jr. 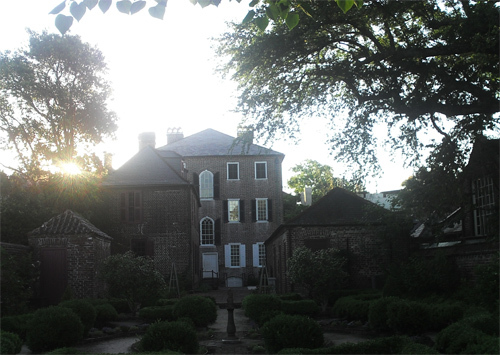 The City rented it for George Washington's use during the President's week-long Charleston stay, in May 1791, and it has traditionally been called the "Heyward-Washington House." Thomas Heyward, Jr. (1746-1809) was a patriot leader, signer of the Declaration of Independence, and artillery officer with the South Carolina militia during the American Revolution. Captured when the British took Charleston in 1780, he was exiled to St. Augustine, Florida, but was exchanged in 1781. Heyward sold the house in 1794. It was acquired by the Museum in 1929, opened the following year as Charleston's first historic house museum, and was recognized as a National Historic Landmark in 1978. It is those other buildings mentioned on the website that gives the Slave Dwelling Project its purpose that is to tell the rest of the story. Of those other buildings, the kitchen is where I along with Terry James and Paul Garbarini would spend the night on Friday, June 15, 2012 but more about that later. Who made the bricks to build the Heyward-Washington House and other houses in the city of Charleston prior to the emancipation of slaves? Who physically built the houses? Who serviced the houses? It is questions like those that inspire me to carry on with this project. Thirty-five stays in eleven states has allowed the Slave Dwelling Project to become more refined. I now insist on conducting at least one public program to accompany each overnight stay. 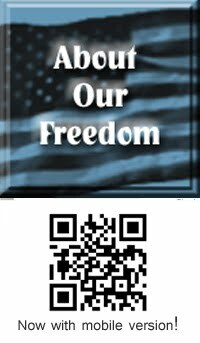 This works well for properties that are open to public visitation on a daily basis. It has also proven successful at some properties that are privately owned however, that choice will continue to be at the discretion of the property owner. 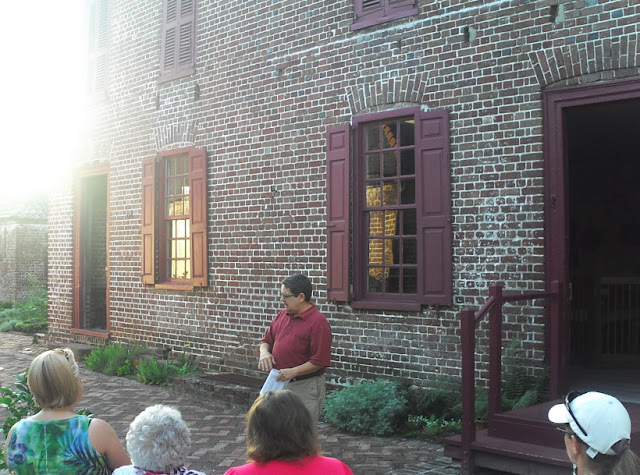 The Heyward-Washington House presented a great opportunity to conduct a public program before the stay. 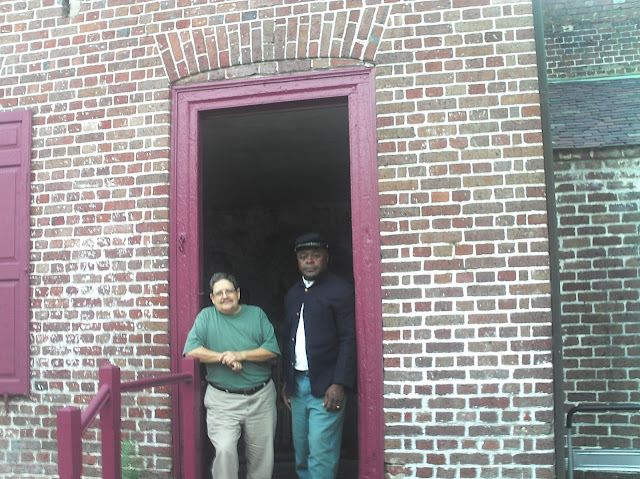 This stay was also an opportunity for the Slave Dwelling Project to further enhance its collaboration with the South Carolina National Heritage Corridor. The publicity leading up to the event generated a respectable diverse audience of project followers, neighbors and new comers who in my opinion, made the question and answer period more interesting than the lecture itself. The weather cooperated to provide the best open air class room for the project. The audience seated comfortably, the “big house”, the kitchen, all the other buildings, and I were all situated within fifteen feet of each other. The space where we would sleep was adorned with many of the items that may have been found in a functioning kitchen of that period. We did not have access to the second level of the structure but it was historically used for sleeping space. Like many stays before, the invitation was open to anyone wanting to share the experience with me. That night, I would be joined by “Old Reliable” Terry James and Paul Garbarini. This would be Terry’s 11th stay and of course Paul’s first. Terry did not get here until very late into the night so it gave Paul and me ample time for quality chat. and many more matters of interest. Terry’s arrival enhanced the opportunity to broaden the conversation. It was not long before the three of us were asleep in the tranquil environment, Terry again sleeping in the slave shackles. The following morning was met with haste. Paul’s invitation for the three of us to have coffee at a nearby establishment had to be declined because of a prior commitment that Terry and I made. 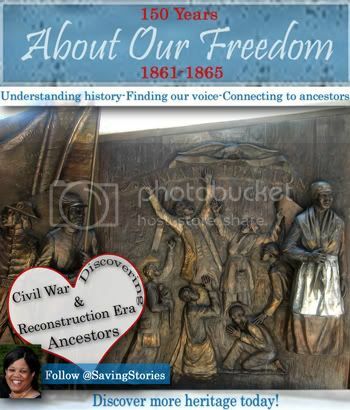 We had to be in Cheraw, SC by 11:00 am to participate in a Civil War encampment at the Southern African American Heritage Center a trip that would take three hours. With that in mind, Terry’s usual routine of meticulously taking pictures had to be hastened. To the best of our abilities, we left the site just as we found it. It was my desire to interact with descendants of those who were enslaved at the Heyward-Washington House. With the challenges that exist for conducting African American genealogical research, I should not have been surprised when I found none. 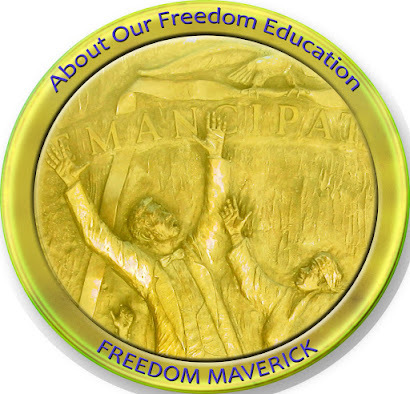 I am often encouraged by followers of the Slave Dwelling Project to connect the places that I stay to people who were enslaved there. Despite not finding any descendants of the enslaved, I was encouraged by an email that I got a few days prior to the Heyward-Washington House stay. The sender of the email reminded me that we both met at the national gathering of the group Coming To The Table and regretted that they could not be joining me for the stay as they had wished. They further reminded me that they were a descendant of one of the slave owners of the Heyward-Washington House. Moreover, this person was more than willing to share additional information but I will let them be more forthcoming with that information in a manner with which they are comfortable. The Heyward-Washington was no Mount Vernon, but George Washington did sleep there. I did not find any descendents of those who were enslaved at the Heyward-Washington House but I did find a descendant of the enslaver. I also got to further my research into urban slavery. It is my hope that other opportunities like this are presented in the future. Thank you, Joe, for creating the Slave Dwelling Project. The importance of your work was obvious to me the first time I heard of it. The slave dwellings in danger of neglect and loss need you, need all of us, to keep the memory of who lived there alive. 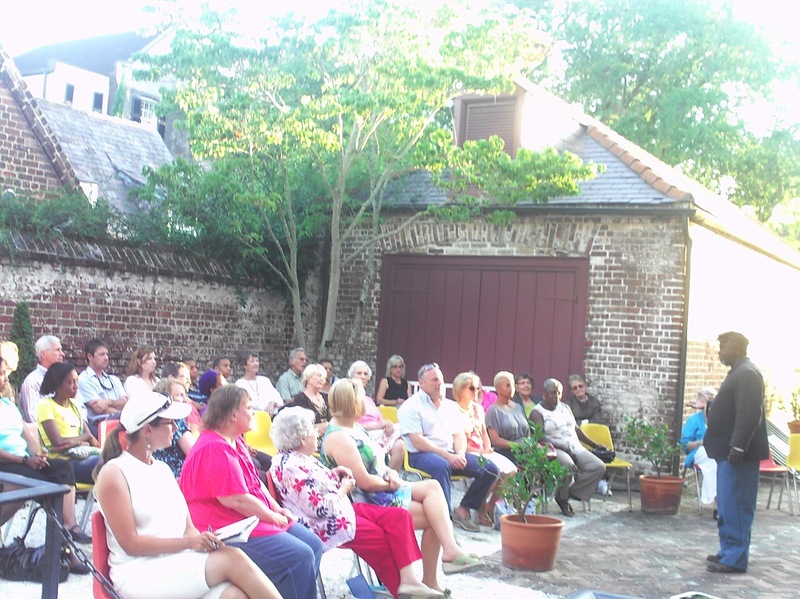 While this home to enslaved people is not in danger of loss, the clarity of Charleston’s slave dwellings is sometimes muddied by calling them by other names. Out buildings. Servant’s quarters. Carriage house. Dependencies. Servant quarters is not necessarily wrong. Some indentured servants almost certainly slept away from the main house. Carriage houses also housed the enslaved grooms and drivers charged with the care of the tack and horses. My favorite is “dependencies.” Who was dependent on whom? In Charleston, from 1800-1850, the majority of the population was enslaved. Slave dwellings were everywhere. A few blocks away from here, according to the 1861 Charleston census, #33 Church St was inhabited by slaves and free blacks. #35 Church the same. In # 59, slaves lived there by themselves. #75, the same. I still need to confirm the houses and addresses because numbering changed, but the relative distance from here is the same. I do know that #20 Church was owned by tinsmith Robert Forbes and housed all but one one of his slaves. The one slave was William and he lived with Forbes at #12 Tradd just around the corner. I am a tour guide. I’ve studied and researched historic properties. Any house in Charleston which was here before 1865 could have been a slave dwelling at one time or another. It was probably built in part with slave labor. Why am I here? For clarity. I’m here for clarity. After our overnight stay, I was compelled to find out who really lived there and maybe track their descendants. Melanie Wilson, of the Charleston Museum, clarified the address and the name of one of the owners. A widow, Margaret Munroe, owned the property in the mid-1800’s. She died in 1847. Her estate carried on and ran it as a boarding house. In the 1861 Charleston Census, the occupants were listed as “slaves.” It was a common practice at the time for slave holders to rent property in the city for those slaves who were “hired out.” The owners would profit from the labor of skilled craftsmen and women and pay them a very small amount for their efforts. Great post you got there Robin. Your post gives me an idea on how can I make my real estate in aspen look like old fashion style. I hope my interior designer can incorporate my idea to his idea.